It is true that I didn't make this 'Egg Florentine' from scratch. I just cooked and assembled the ingredients that I bought from the supermarket. Should I feel guilty about that? No, I shouldn't. How many people would be making their own bacon, ham or sausages for their breakfast? I mean from scratch. Even most of the restaurants don't make them. Anyway, I had a delicious breakfast this morning. Everything was so well done. The poached egg turned out the way I wanted. Place fresh spinach in a microwavable bowl. Add two tablespoons of water to the bowl. Cover and microwave for 30 seconds. Pour water into a saucepan until half full. Add one tablespoon of vinegar to the water. Turn down the heat to simmer. Slowly crack an egg and drop it to the water. Gently move the egg around. Cook for about 2 to 3 minutes or to your desire. For Hollandaise sauce - Follow the package directions. 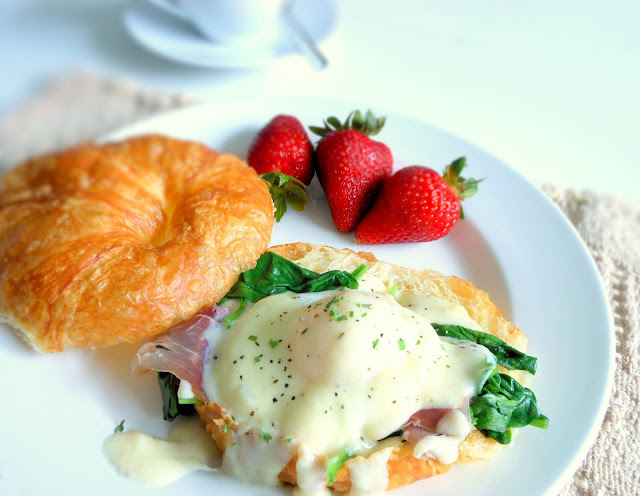 To assemble the Egg Florentine, cut the croissant in half. Arrange the cooked spinach on top of one side of the croissant. Add a layer of prosciutto. Top with a poached egg and pour Hollandaise sauce over. Serve immediately.